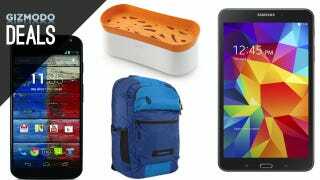 If you’re in the market for a new smartphone, here are a couple of great deals. Motorola offered the same Moto X deal directly yesterday, but Amazon has matched and extended it if you missed out. Why are we highlighting a deal on a trashcan, you ask? Because with an easy open touch bar, fingerprint-proof stainless steel design, and fantastic reviews, this is the Cadillac of kitchen garbage receptacles. $105 represents Amazon’s best deal ever on the product by $15. If you have any rugs or carpeted floors, you won't want to miss this deal on the Rug Doctor X3 steam cleaner. Granted, $300 is still a pretty penny, but that's $100 less than you'll find it anywhere else. Today only. I bought the black version of this backpack a few weeks ago, and it’s fantastic for the price. Timbuk2 is one of the most trusted names in the bag business, and all of their products come with a lifetime warranty. Amazon is already offering a $30 discounts on Samsung's brand new Galaxy Tab 4, both in 8" and 10" flavors. As you'd expect from Samsung, the tablets are overflowing with features, some of which ($10 of Google Play credit, 50GB of Dropbox space, IR blaster) are even useful. Take the pain out of pasta by cooking it in the microwave with this clever device. I admit, I raised an eyebrow when I saw this, but it has fantastic user reviews. Update: Sold out, but Hon-GDB pointed out the similar Fasta Pasta, which is only $10 today. IOGEAR SUB Bluetooth 4.0 Adapter ($10) | Newegg | Promo code EMCPEPH74. Perfect for Hackintoshes. 96 Keurig K-Cups ($40) | Bon-Ton | Add two to cart and use promo code FREESHIP25 for free shipping.